Air cooled chillers are a common type of liquid chiller because they are simple to install, easy to maintain, and typically less expensive than water-cooled chillers and evaporation-cooled chillers. Air coolers eliminate the need for a cooling tower or condenser water pump, so they often take up less space than other types as well. However, air cooled chillers require more power to operate, typically consuming approximately 10% more power than a water cooled unit. This is because of the need for higher condensing temperatures (120° F to 140° F), combined with the fact that dry surfaces transfer heat less efficiently than wet surfaces. Large air cooled chillers are usually placed outdoors. Since the heat from the process liquid is transferred into the air, air cooled chillers can be used strategically in systems in which the additional heat they discharge is beneficial. For instance, the hot air produced by air cooled chillers can be directed to help heat facilities during the winter. Air cooled chillers can be used for applications including troughs, tanks, nozzles, mixers, rolls, air coils and radiators, lasers, molds and dies, among others. Air cooled chillers work by piping a refrigerant through a condenser coil and blowing air through the coil in order to condense the refrigerant and dispel the heat into the atmosphere. The cooled refrigerant can then be sent back through to where the heat is being generated so as to continue its job of cooling. Air cooled chillers are designed to lower the temperature of any liquid such as water, chemical coolants, oil, brine, alcohol, acids, and other fluids, although water and water mixed with a coolant additive are by far the most common. These coolants can in turn be used to cool various processes or my be used to cool and dehumidify air for air conditioning systems. Industrial air cooled chillers look like large air conditioning units, and are measured in terms of cooling capacity by tons, ranging from small, portable 1/4 ton units to over 1200 tons. Air cooled chillers vary in their condenser flow rates and evaporator flow rates, both of which are measured in gallons per minute, or gpm. Other specifications to look at include its power source, cooling capacity, fluid discharge temperature, compressor motor horsepower, and the range of ambient temperatures at which the chiller can operate. All told, air cooled chillers can provide simple and effective solutions for many process cooling needs. Air Cooled Chillers Air cooled chillers use air to absorb heat from a process liquid and transfer it into the atmosphere. 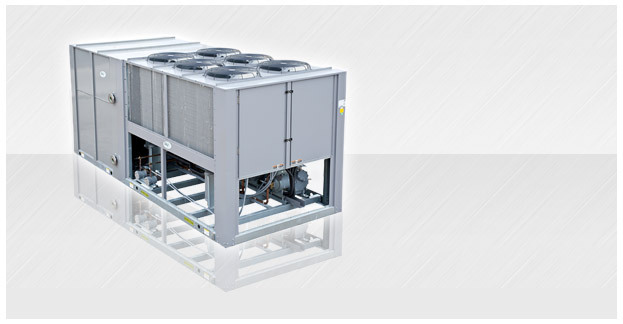 Air cooled chillers are one of three major types of liquid chillers, providing a straightforward chilling option used in many industrial applications. The other two types of chiller are water-cooled chillers and evaporation-cooled chillers.